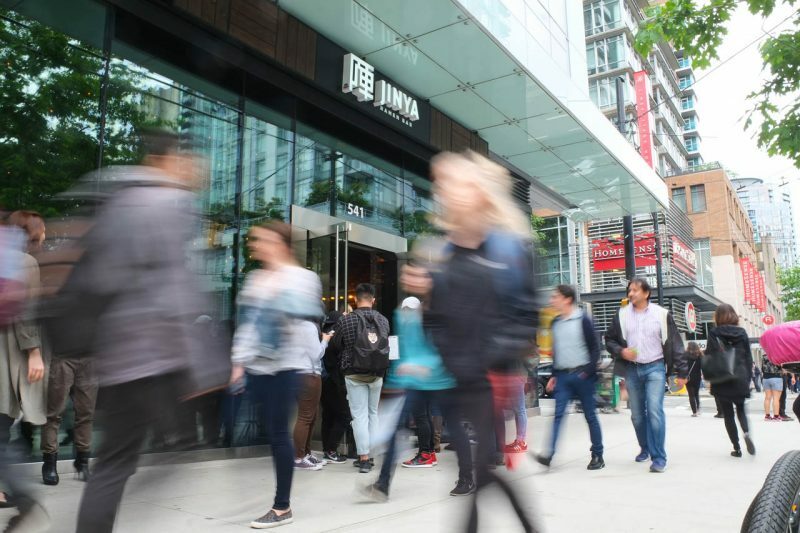 The new JINYA is on the corner of Robson and Richards. Tons of foot traffic here. 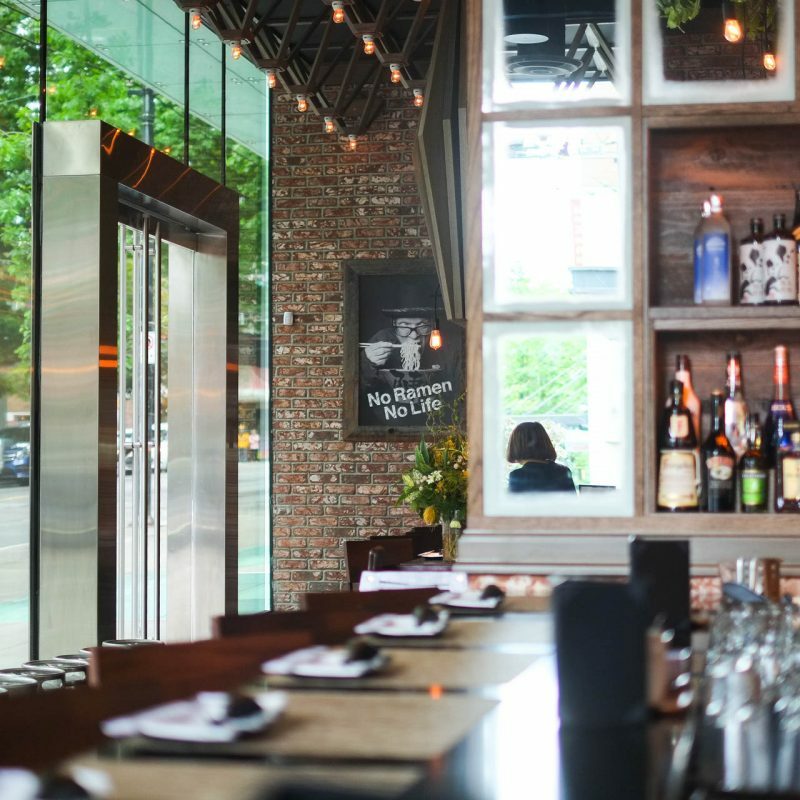 Get used to waiting for your table here. Luckily they’ve built an overhang to keep you dry. Remember when I said “hi-tech makeover”? 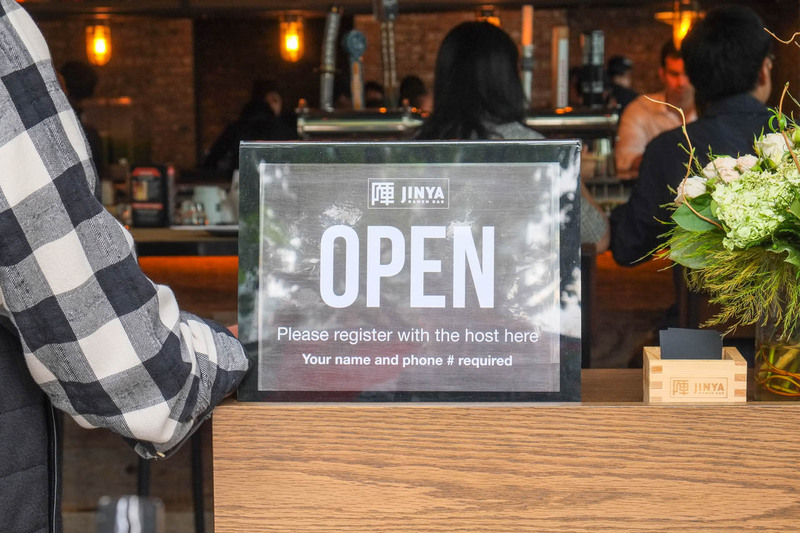 Instead of the old clipboard and pen, the new JINYA features a text-message-based reservation system. 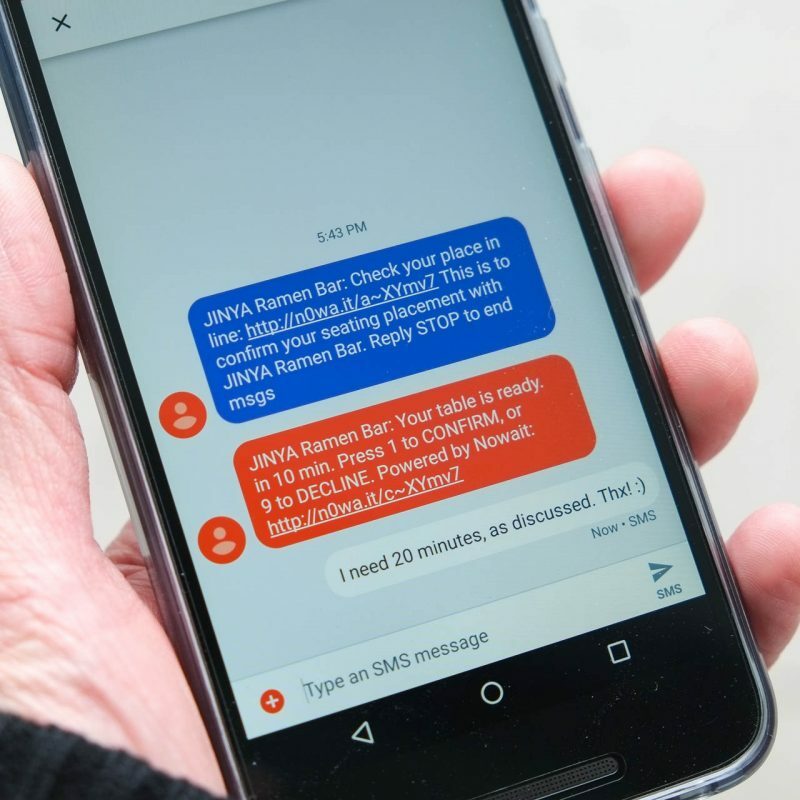 You give them your name and phone number and they text you when your table is ready. People have told me that waits have been up to three hours for just two people. We only had to wait for 10 minutes. 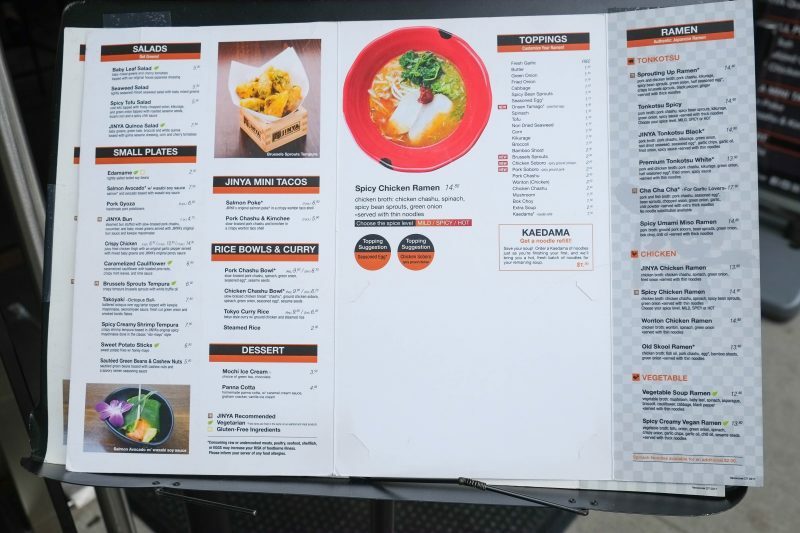 One side of the new expanded menu. 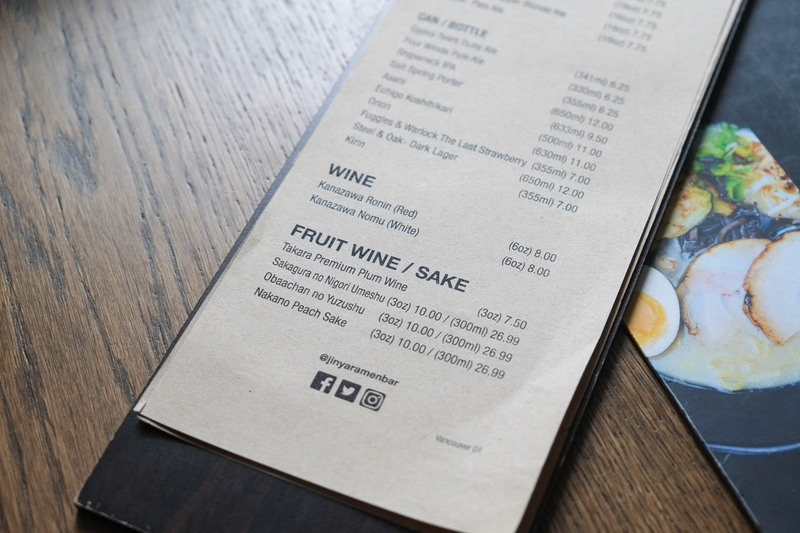 Crisp, clear PDFs of their menu are available to download off their website. 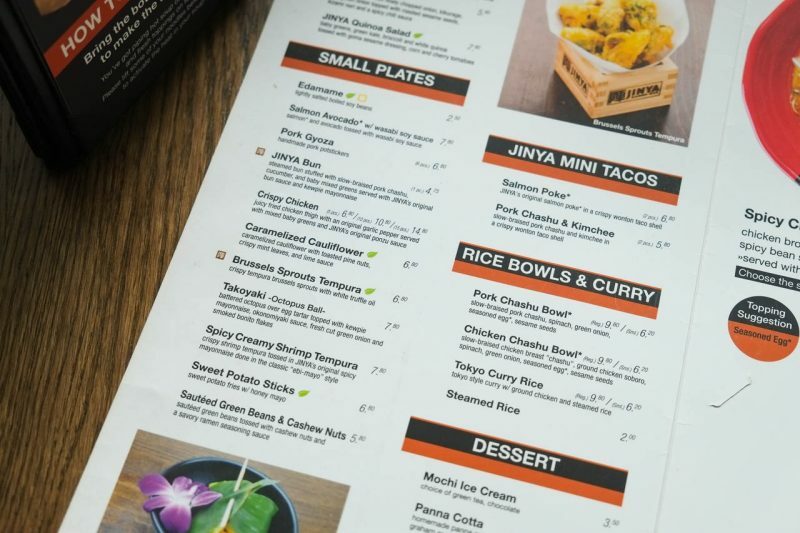 Other side of the new menu. 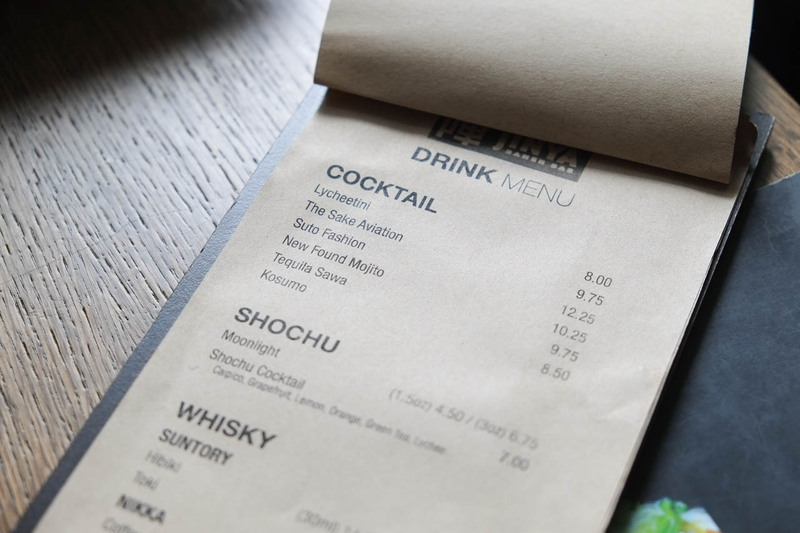 New happy hour menu. Spot the quinoa, tacos, and poke? 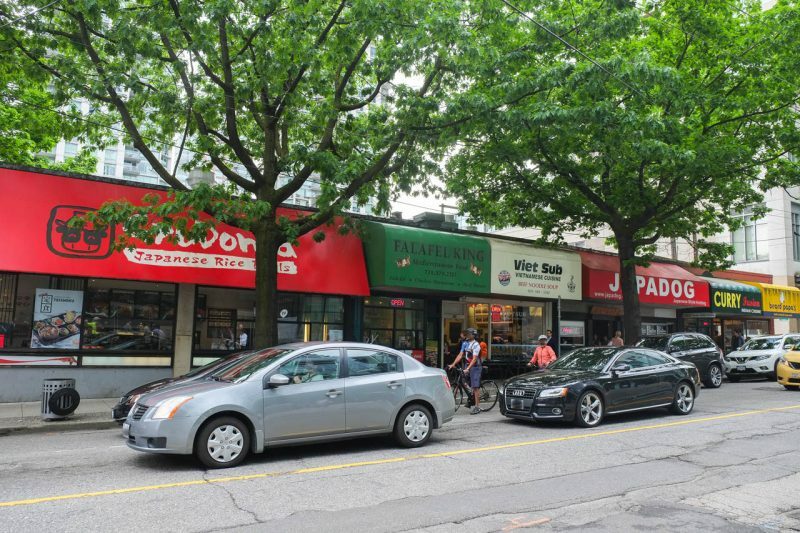 Across the street from JINYA. 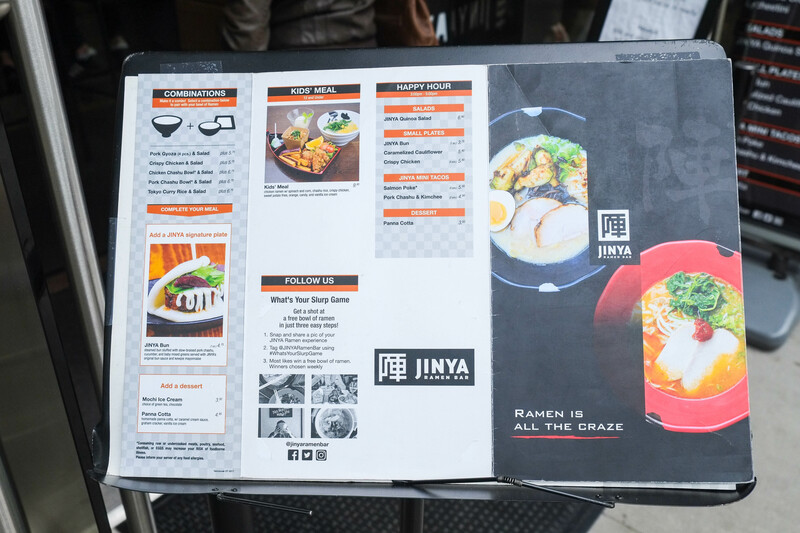 Yah Yah Ya Ramen is located a block away. 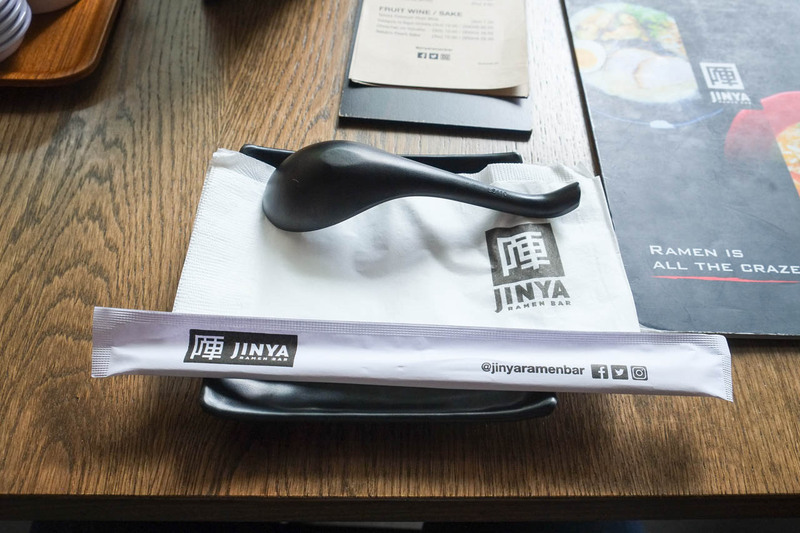 I have a feeling that JINYA has been sucking a lot of business away from Yah Yah Ya and creating a vacuum in Yah Yah Ya’s cavernous waiting area. You put your name and number down, but you still need to have everyone present before they’ll seat you. This text messaging system is pretty slick though. Side plate comes standard! 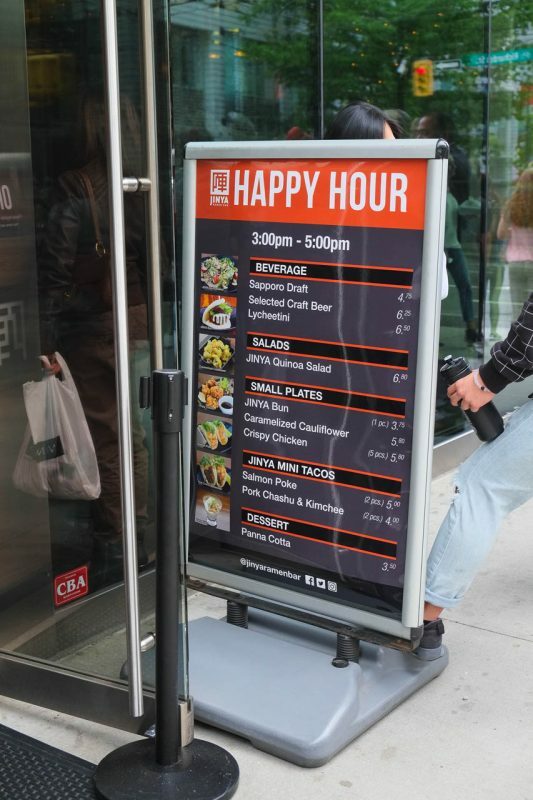 Awesome idea that makes it much easier to eat shared food. 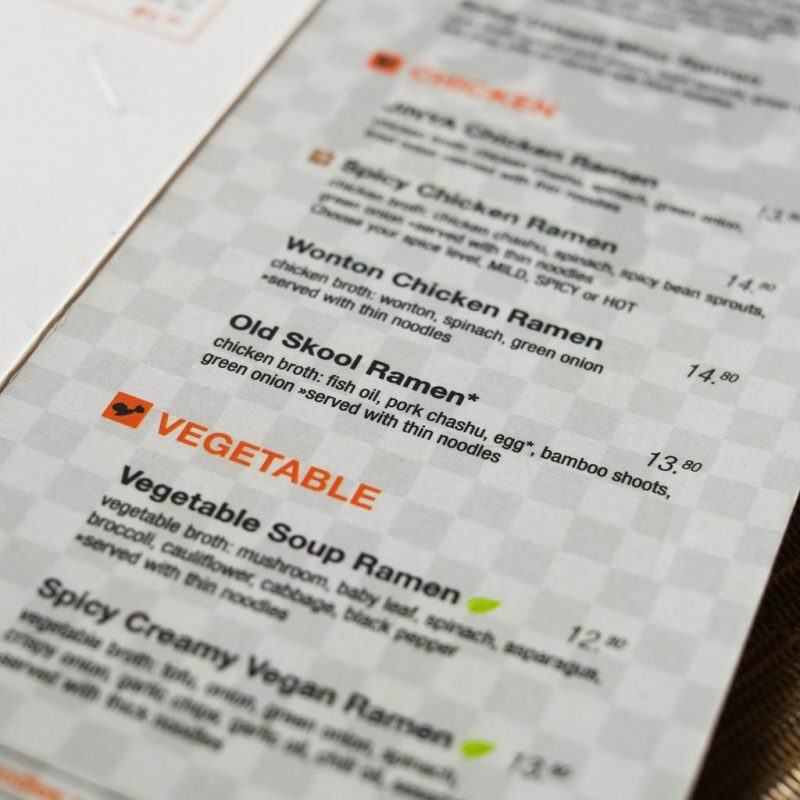 And the staff quickly remove your paper chopstick sleeve after you open it. Attention to detail and customer service! 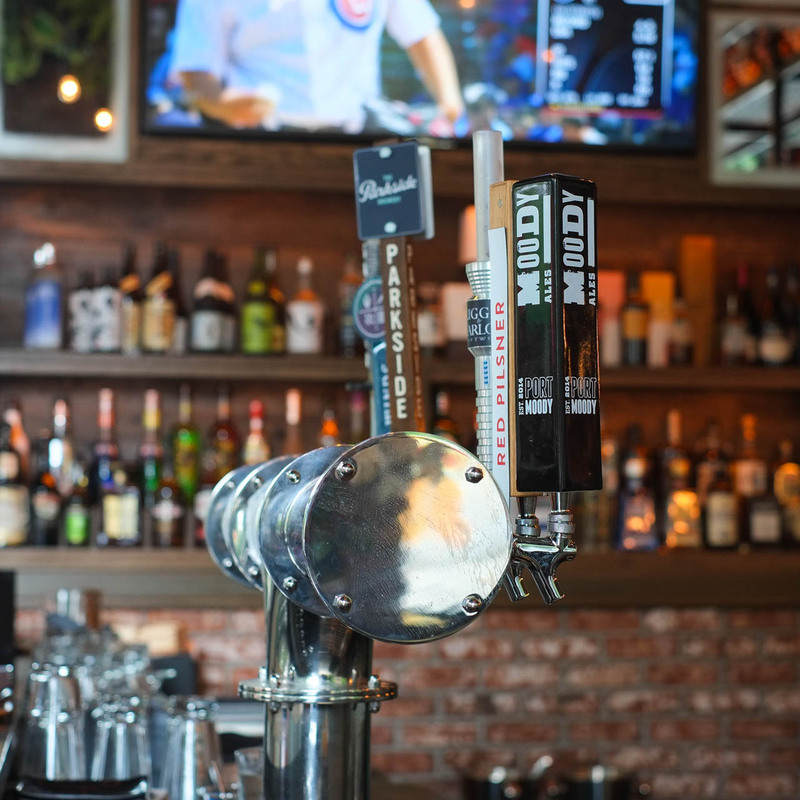 The craft beer list, while not exciting to a craft beer geek like me, is still a welcome sight in a non-craft beer establishment. Looks like they have a strong relationship with Fuggles & Warlock, who have a tap and a seasonal can here. 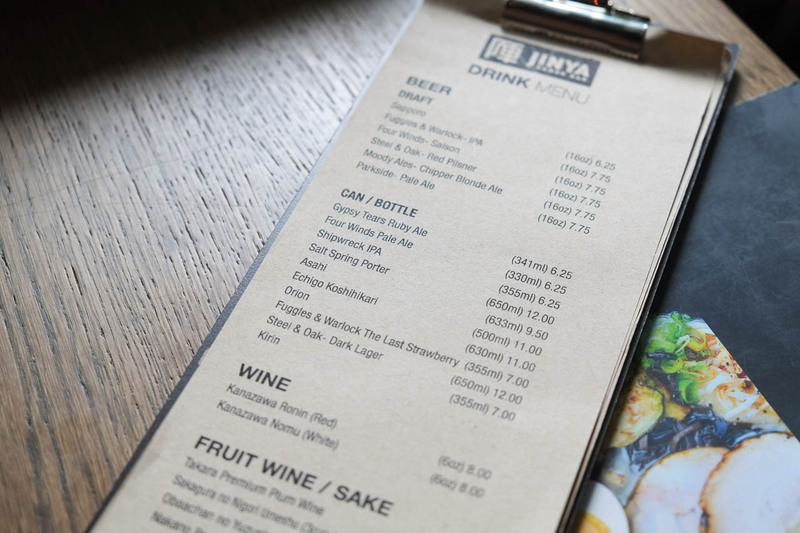 The staff here have GREAT product knowledge, even recommending beers and pushing personal faves off the food menu. Our server tried to sell me on Orion (a Japanese lager that I’ve already tried at Zakkushi) but snoooooze. Nice try. It’s a typical Japanese rice lager, but I wanted something a bit more exciting. 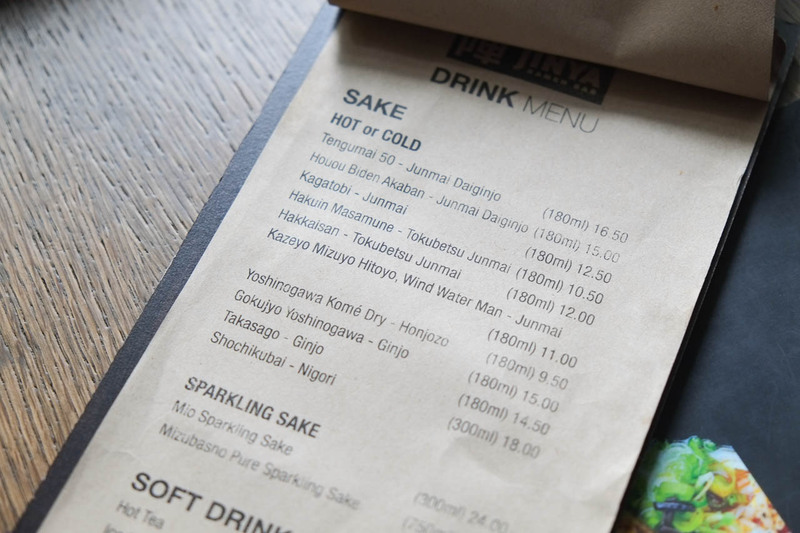 I like the occasional sake but don’t know much about it other than they polish rice grains down to make it. These are definitely “downtown core” prices. 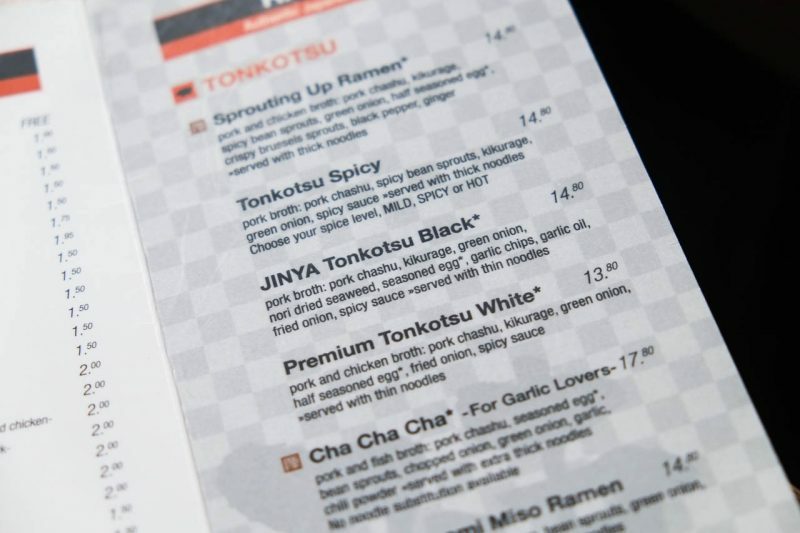 I went for the JINYA Tonkotsu Black to compare with my previous experiences at the old JINYA. 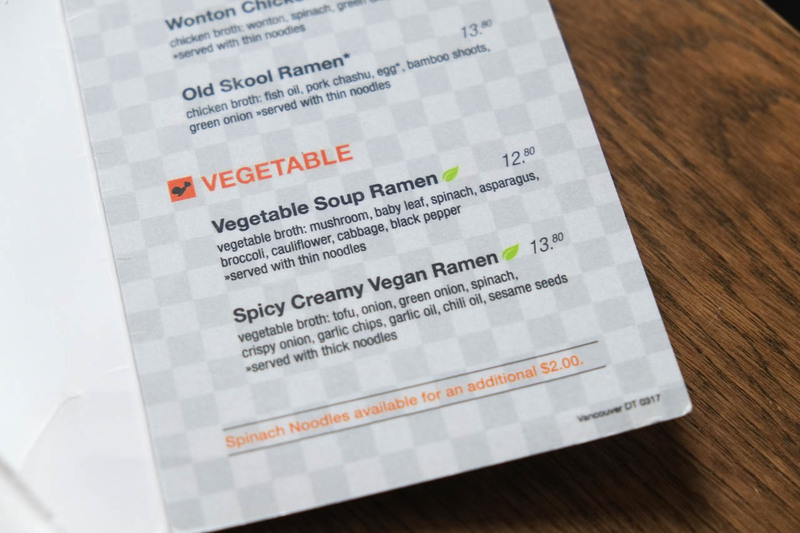 They also have vegetarian and vegan ramen. 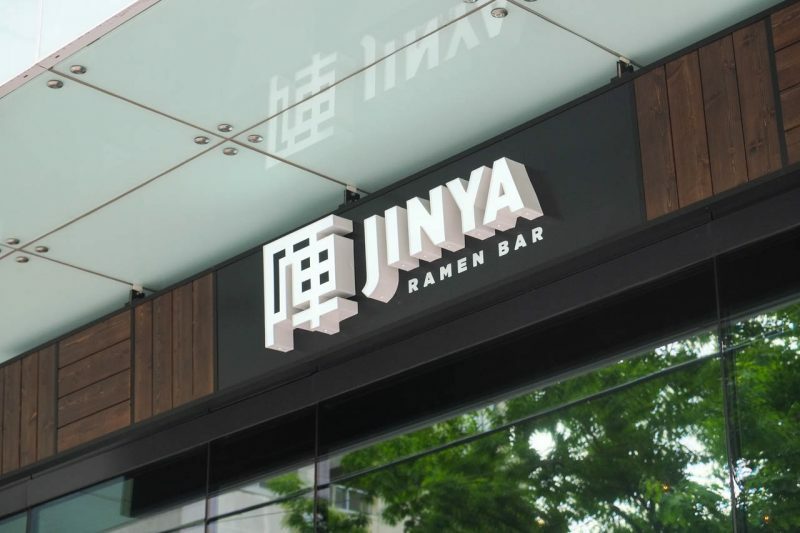 Totally seems like the sign of a ramen chain that wants to go global by incorporating all these food trends. Case in point: Brussel Sprouts Tempura. Also mini tacos, one of which has salmon poke in it. They also have a quinoa salad! Sweet potato fries! 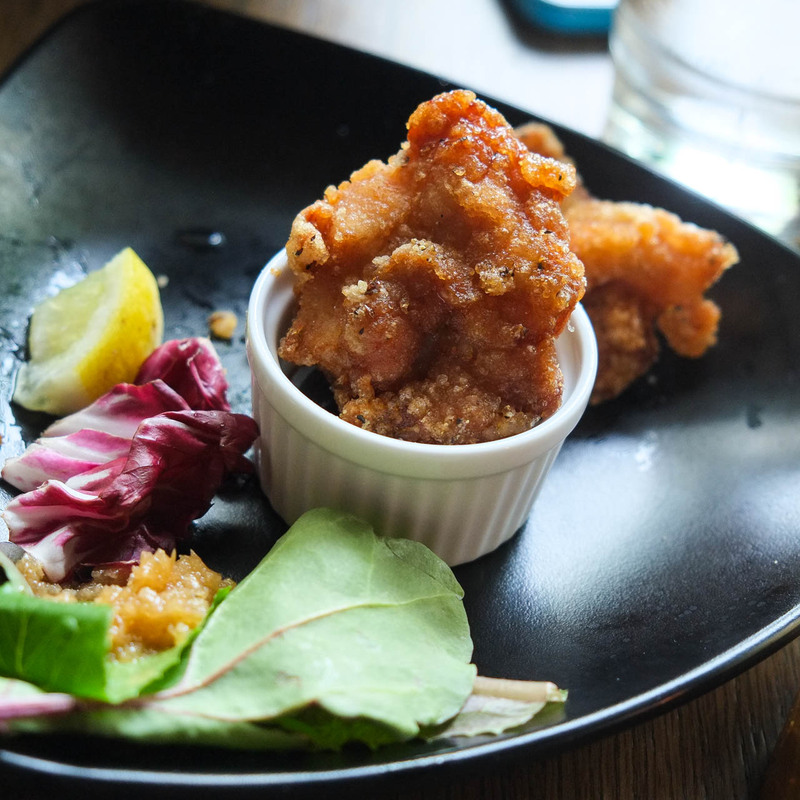 It’s like ramen mashed with all the casual fine dining trends from the past decade, with a splash of izakaya-style dishes. They have a disclaimer about the eggs. 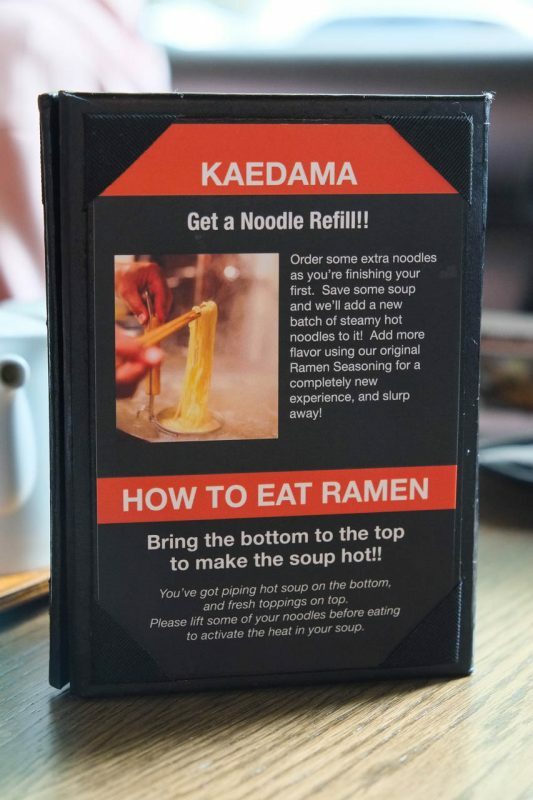 First I’ve seen in a ramen place. 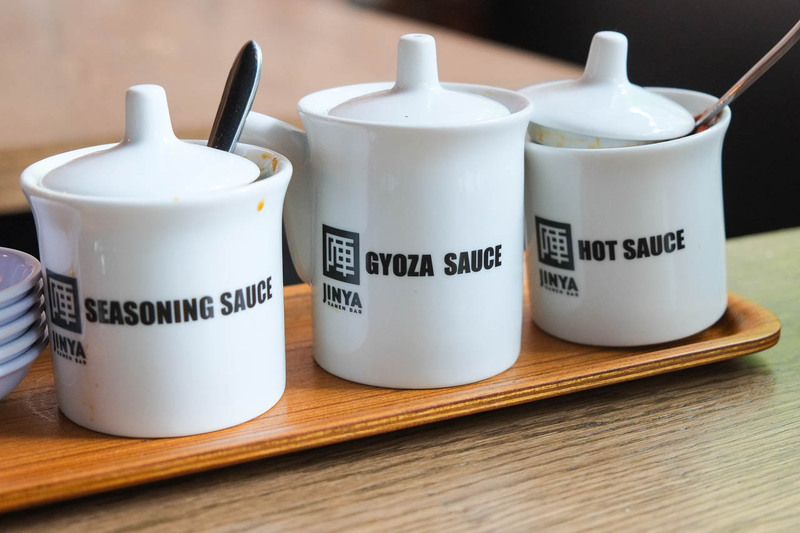 They’re proud to point out their tableside sauces. I didn’t have to use any of these, but nice that they’re available. 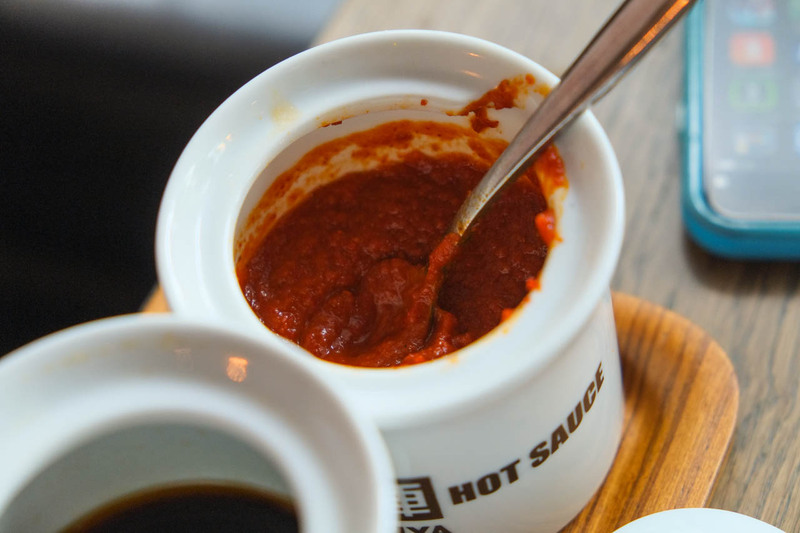 The hot sauce looks like a chunky Sriracha. I didn’t taste any. 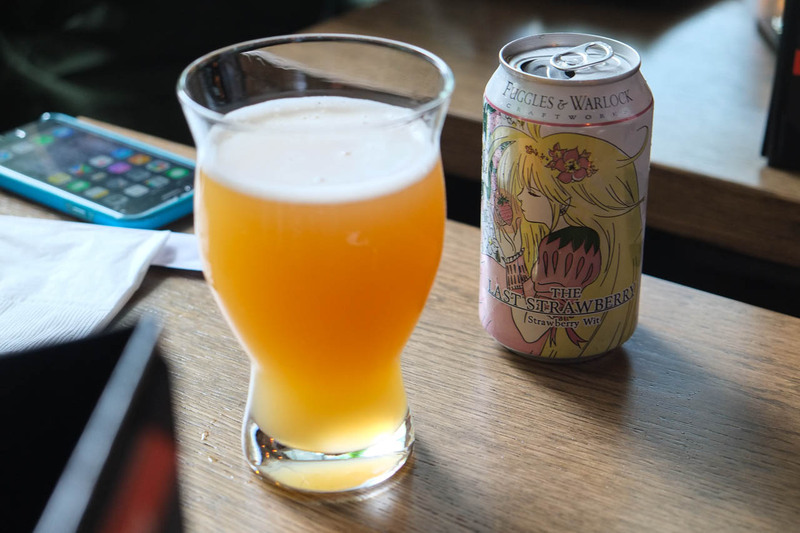 My dining partner Moyenchow got the Fuggles & Warlock The Last Strawberry Wit (4.9% – $7.00 for 355ml can) to help ease the stress of the workday. This beer has always reminded me of strawberry Quik. 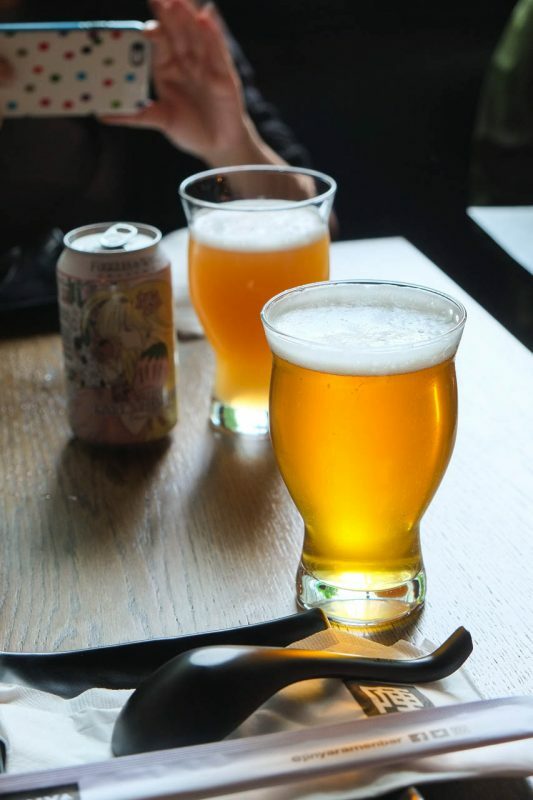 The pretty can was a conversation piece that made people around us take notice. I got the Fuggles & Warlock Destiny IPA (6% – $7.75 for 16oz). At least I think it was their core IPA. It was only listed as “IPA”. Big citrus/fruity aroma and a long bitter piney finish, which becomes more prominent depending on what you’re eating. 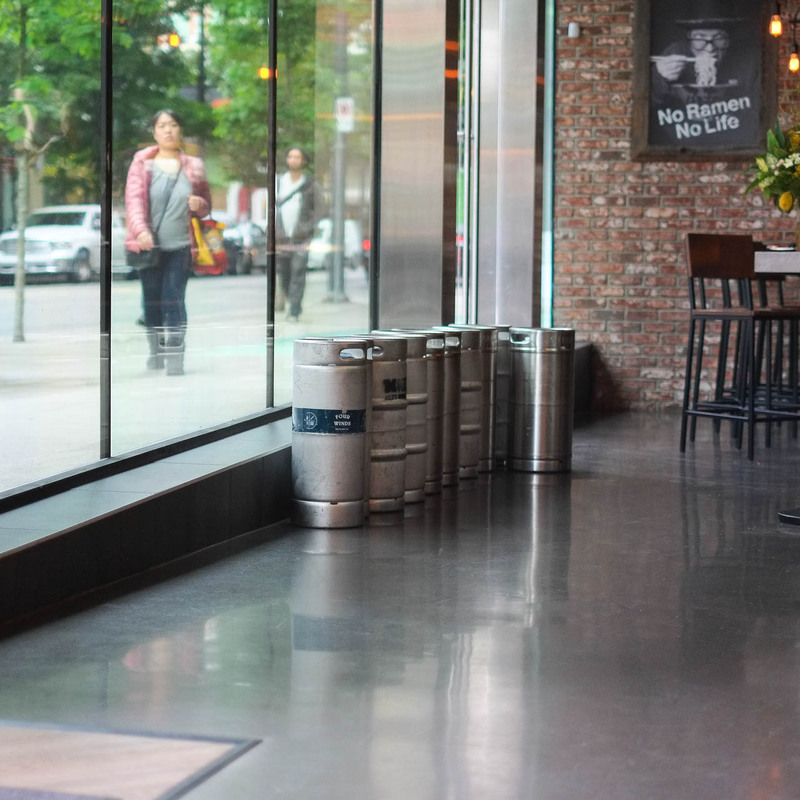 View of the central bar from the washrooms. Speaking of washrooms, there was only one stall and one urinal in the guy’s washroom. But I guess for the number of seats here, that’s technically enough? More notes about non-food stuff: The music here was the best out of any Japanese place I’ve been to. They played stuff like Little Dragon “Ritual Union” and Pet Shop Boys. Really up my alley. The POS system runs on tablets, so servers take your order and punch it into their tablet, which they read back to you before sending it to the kitchen and/or bar. 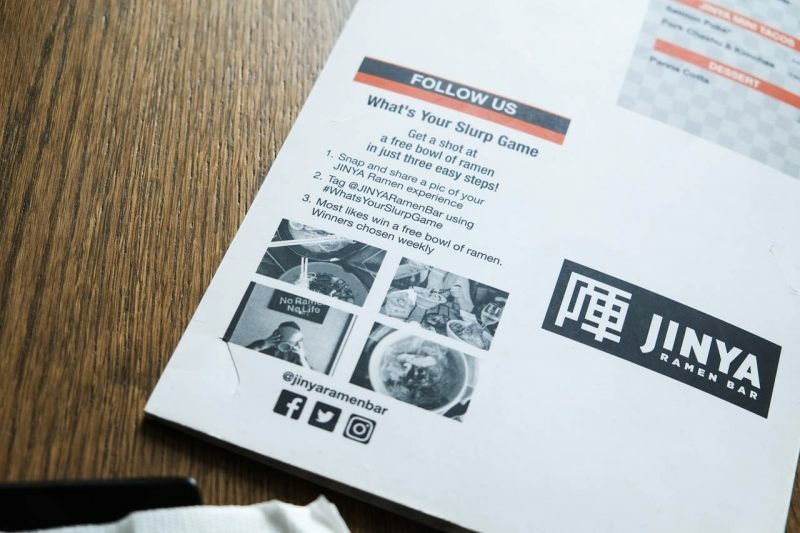 They also appear to have been responding quite proactively to their measly 2.6/5 rating on Google, a rating which really does not reflect what we experienced during dinner (and what I experienced the next day during an early lunch). 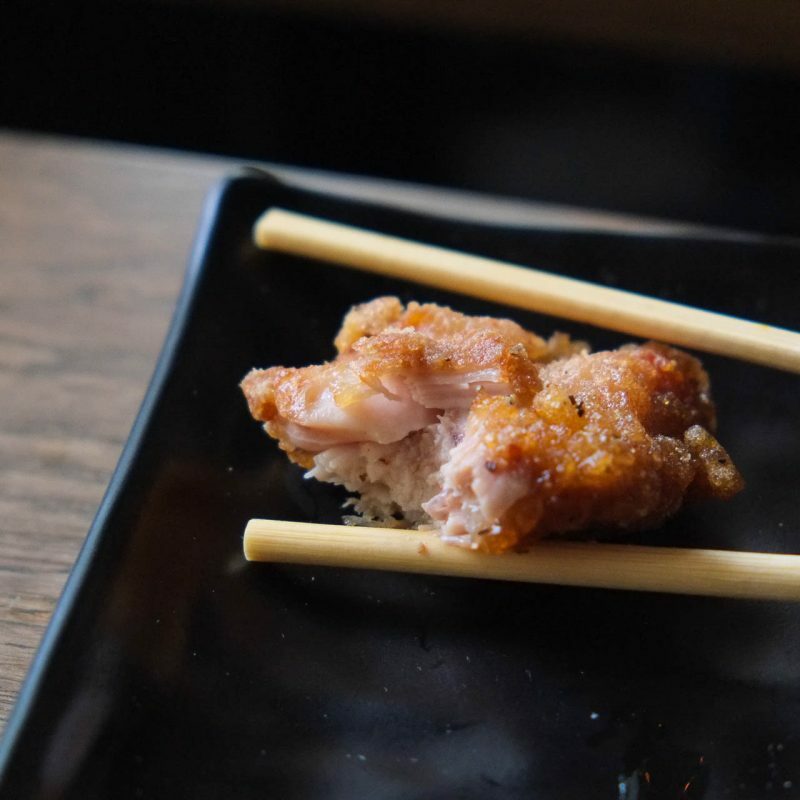 Crispy Chicken (5 pieces for $6.80) with ponzu sauce and a pile of “original garlic pepper” that looks like a marmalade but tastes like garlic. 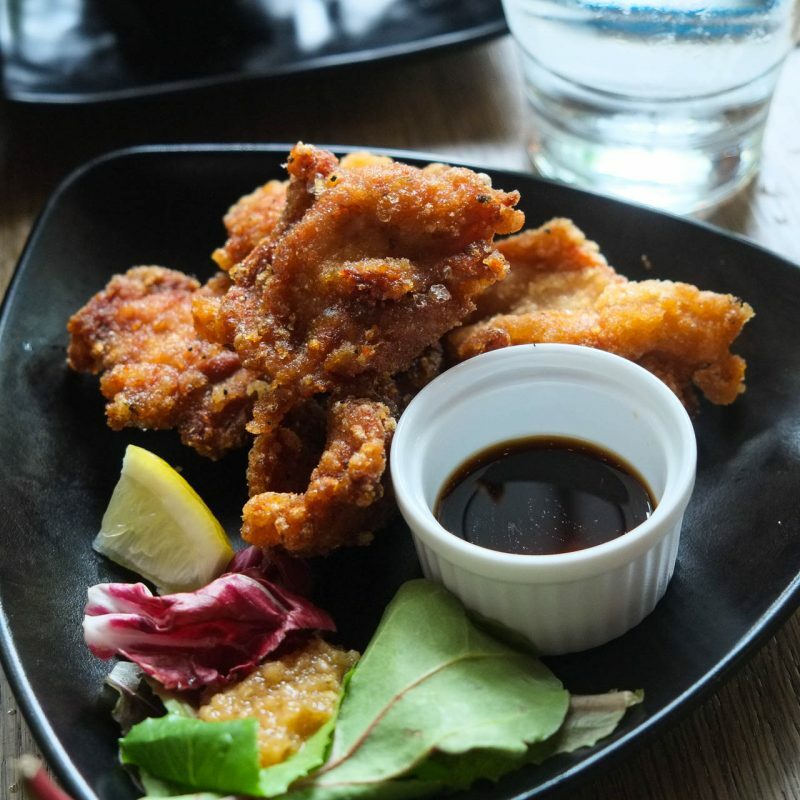 They use thigh meat (which I think most Japanese places use). Minor malfunction. Most of the chicken pieces couldn’t fit into the ramekin unless you bit a piece off to make it fit. May cause issues if you’re sharing between friends that are averse to sharing saliva. Not as juicy as I’d like, and not as crispy as I’d like. 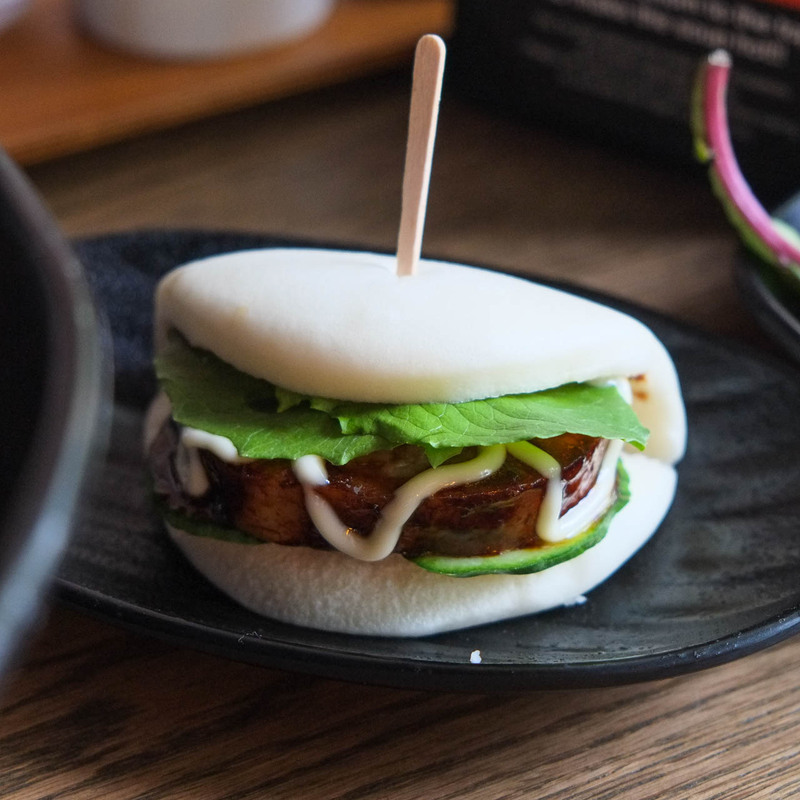 Flavour and seasoning was ok.
JINYA Bun ($4.75) with braised chashu, baby greens, some thin slices of cucumber, “JINYA original bun sauce” (possibly has hoisin? ), and Kewpie mayo. 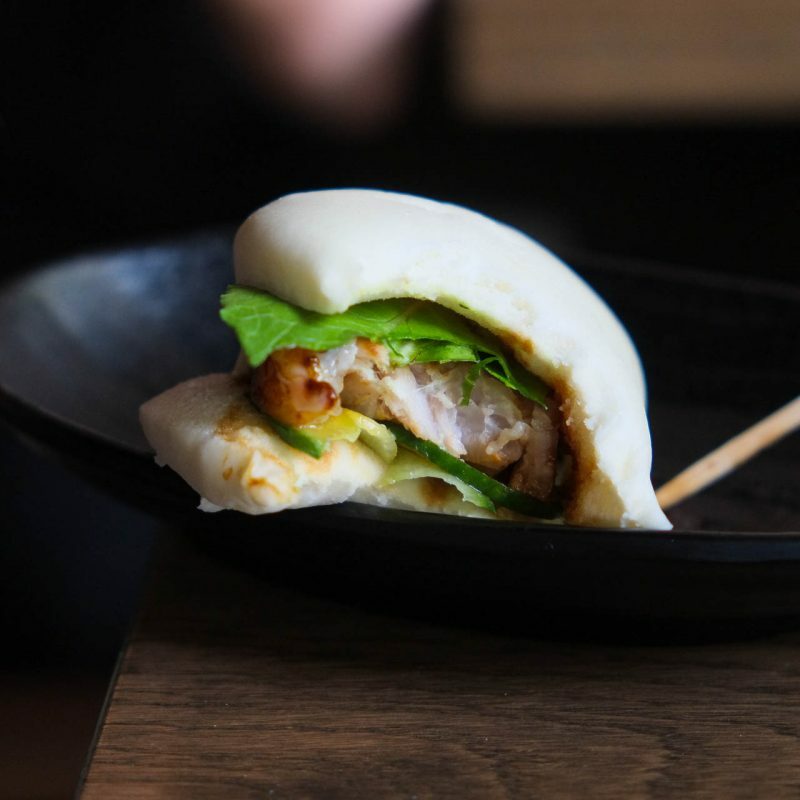 This was a personal fave of our server, and while it was good for what it was, I think I’m just not that thrilled with the sweet/savoury soft chashu paired with the sweet and soft bao. Maybe just not my thing. Technically it was good. The bun was soft, moist, and warm. 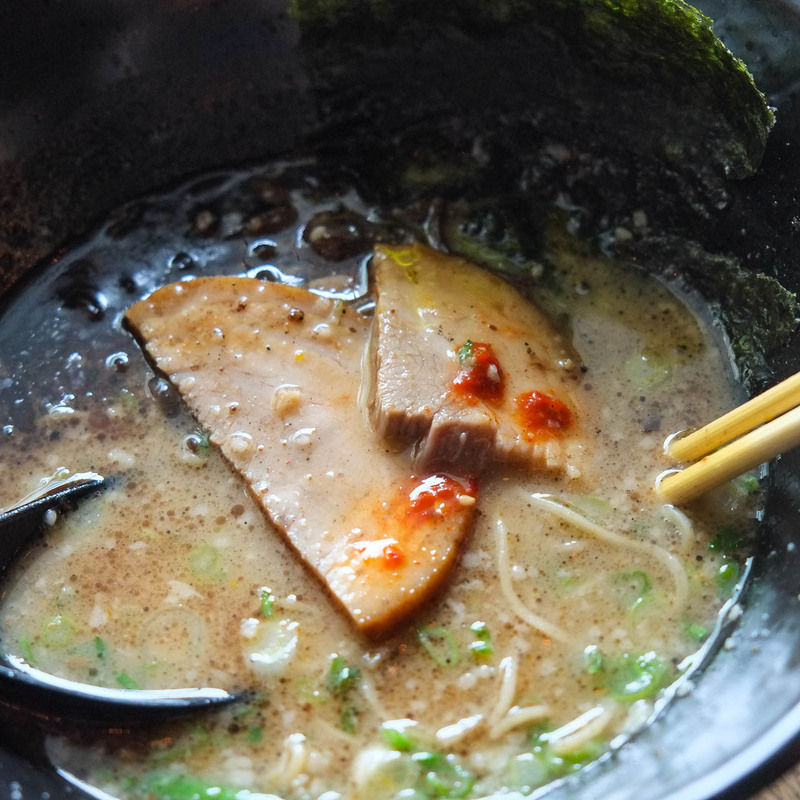 The belly (or belly-adjacent) chashu was well-seasoned, moist, and tender. Maybe a few more slices of cucumber would’ve provided a bit more texture? But really, I think I just don’t like this kind of dish a whole lot, and it’s not necessarily a strike against this dish. You might love it. Moyenchow’s Sprouting Up Tonkotsu Ramen ($14.80). 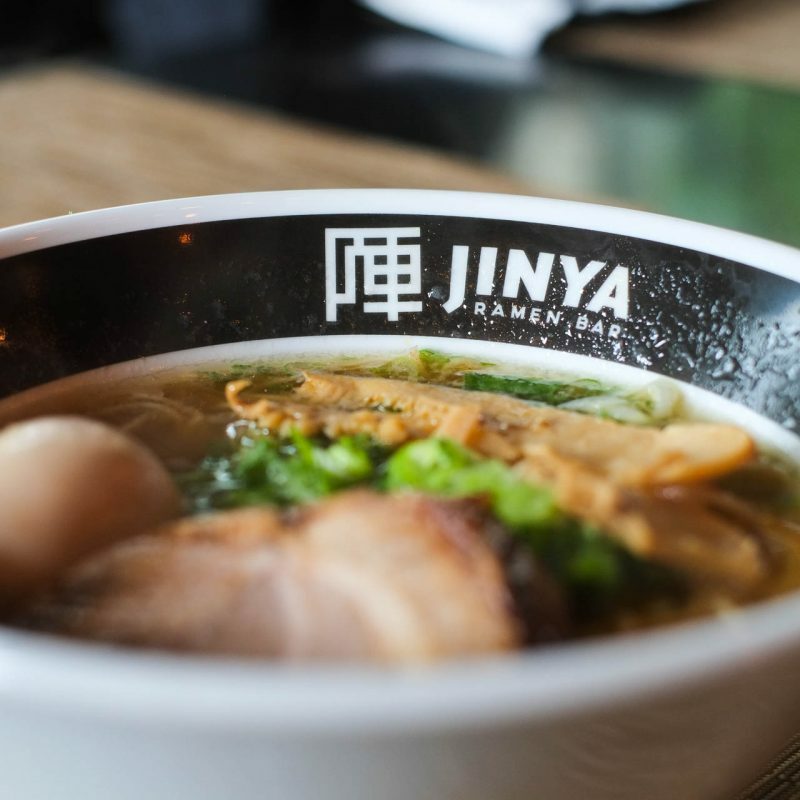 Has the typical JINYA toppings with the crazy addition of crispy brussel sprouts. You’ll have to wait for her review to see what this tasted like. 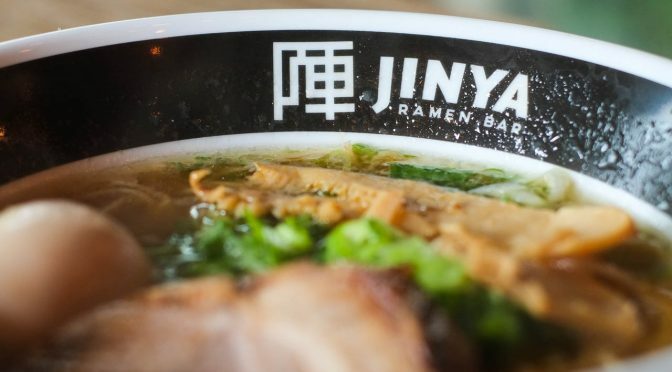 JINYA’s noodles are made in California but NOT by Sun Noodle. I didn’t pry any further. The thin noodles they use here now contain whole wheat flour! 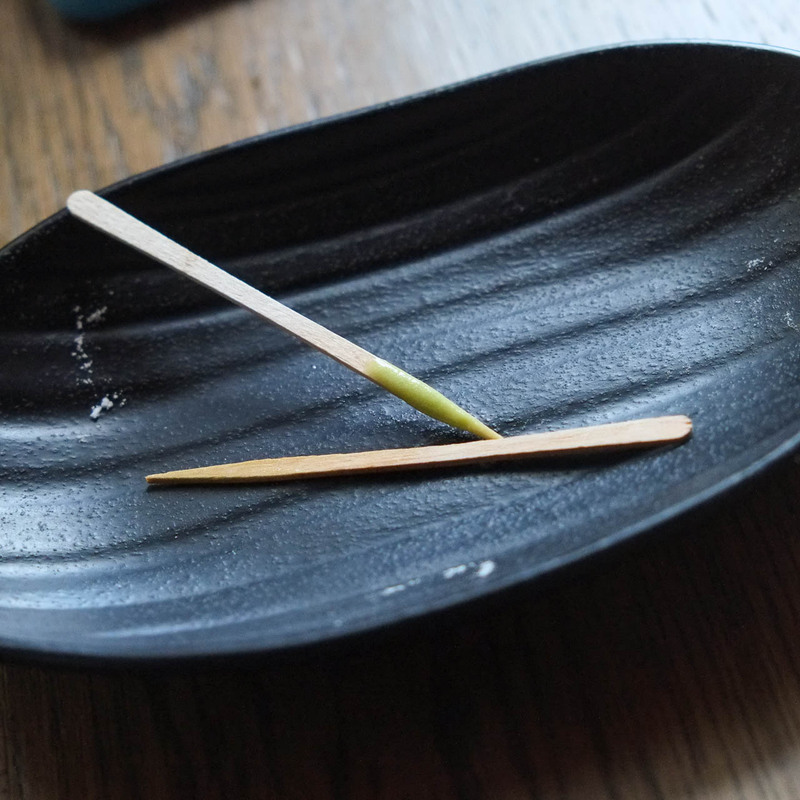 I saw the flecks in the noodle and thought maybe they were grinding up kombu to put in their noodle dough (like how Shiki Menya in Calgary does) but the flecks weren’t quite the same colour. One of the managers later told me that they tweaked the noodles with whole wheat to give it a bit more bite and texture. The whole wheat also makes them a bit “healthy” I guess too? 😀 This totally fits in with JINYA’s company culture of kaizen, which is the Japanese word for “continuous improvement”. If you follow Fujifilm or shoot with a Fuji camera, you might be familiar with this concept. Now, the question is, where does the inspiration for improvement come from? Internally or from customers? Maybe a bit of both? Even with the addition of whole wheat flour, these thin noodles still triggered that sense memory of eating Chinese wonton noodles. They’re not the same as wonton noodles, but do have some qualities that remind me of the experience of eating them. Something about the guage and texture. They have firmness and a bit of spring to them. I like them a lot. You must eat them fast, lest they get too soft. 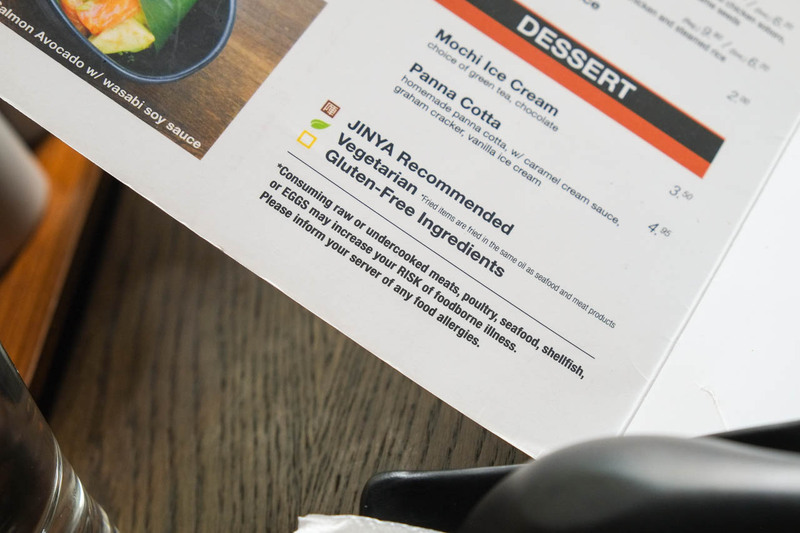 The ajitama at JINYA has been a weak point for me in the past. This time the eggs were improved. Still not to the consistent level of Marutama, but close enough. The rest of the elements make up for it. The chashu isn’t as fall-apart tender mush now (which I didn’t mind, actually). Really good flavour and tenderness. 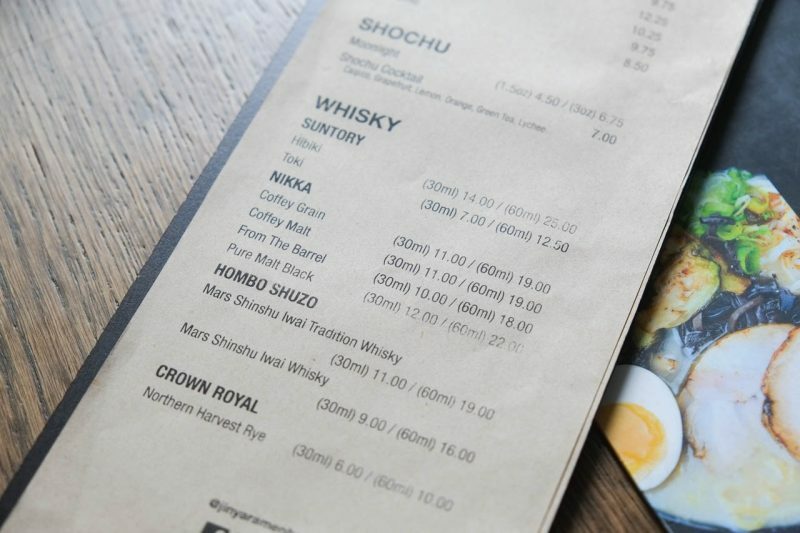 I can’t quite tell if they use belly or shoulder or something else for their chashu. This sort of looks like belly (or belly-adjacent, like I mentioned above), but what I had for lunch the next day looked more like shoulder. 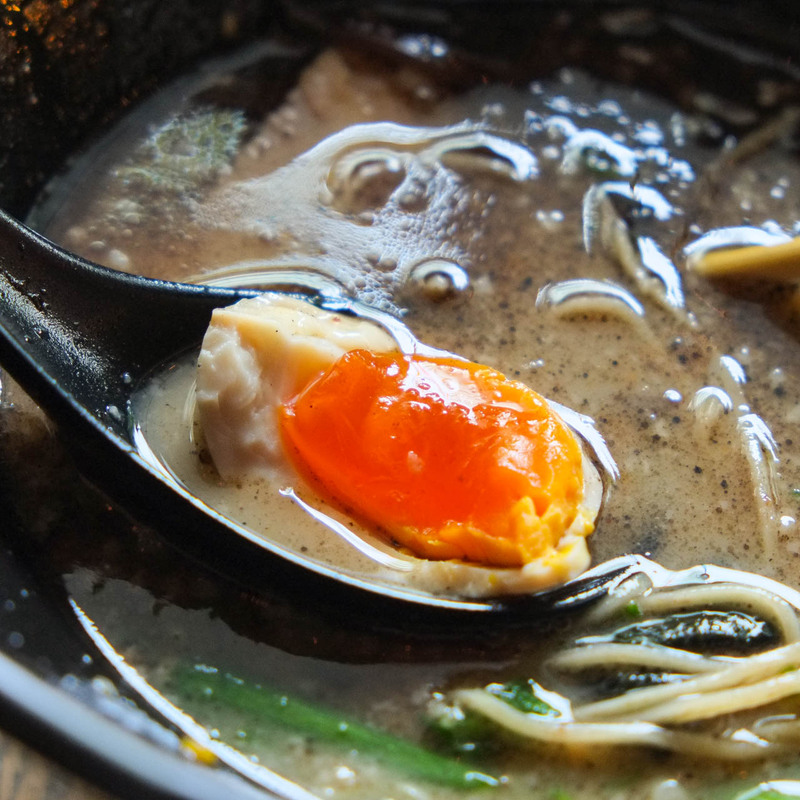 Another shot of the jelly-like yolk (edges getting a bit set and grainy) and that luscious broth. Seasoning of the broth was great. Not too salty. Good complexity and mouthfeel. Acceptable amount of garlic oil. I wonder if they have the ability to punch in “extra garlic oil” on their tablets? 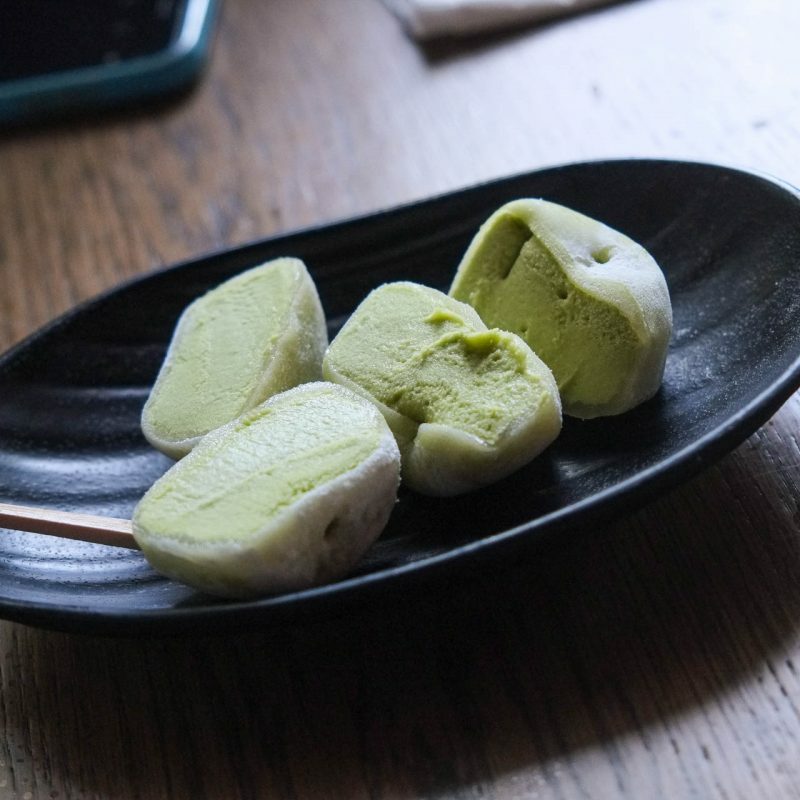 Green Tea Mochi Ice Cream ($3.50). Ice cream was cold and sweet. Much sweeter than say Mario’s Gelati green tea ice cream. Otherwise standard for this kind of thing. It actually arrives to the table cut in half, which is handy for sharing. We pulled it apart for the photo. I’m not a dessert person but I enjoyed it well enough. 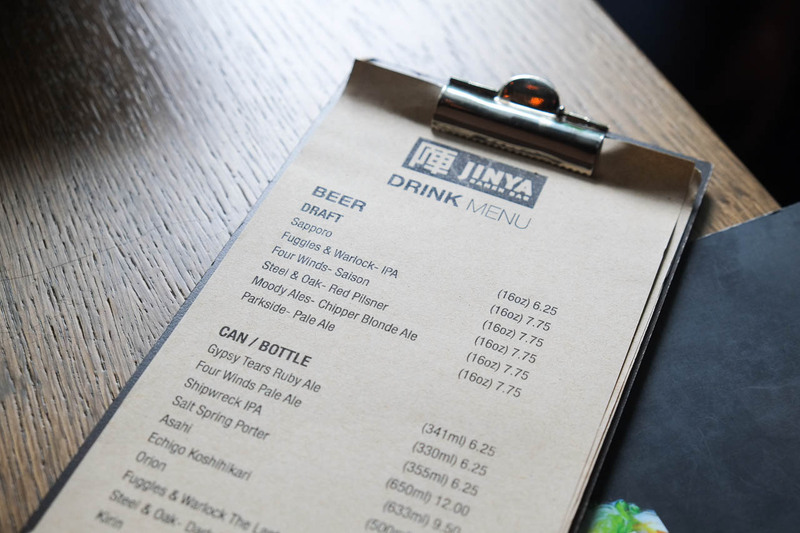 I am loving the sight of craft beer tap handles in a ramen joint. “No Ramen No Life”. I think this phrase of “no x, no life” seems to be common to modern Japanese culture, having seen a dorama or movie that featured the phrase “no music, no life” a lot. I can’t remember which dorama or movie that was. ADDENDUM: it was Detroit Metal City, and the phrase was actually “no music, no dream”. Who says craft beer doesn’t sell? This is the one I was interested in! 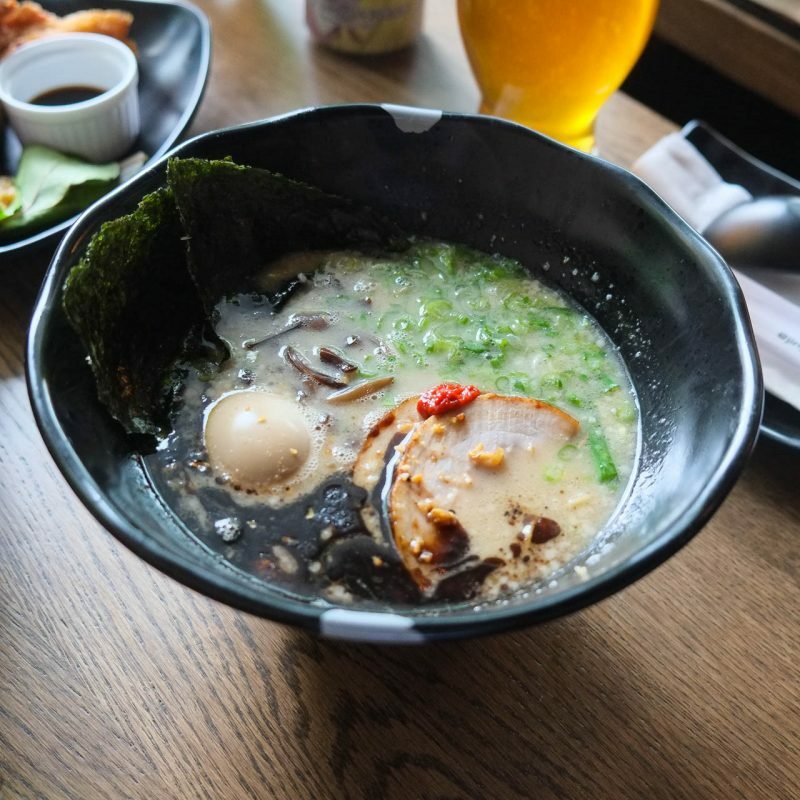 “Old Skool Ramen”…I do miss the clarity and lightness of non-tonkotsu ramen. 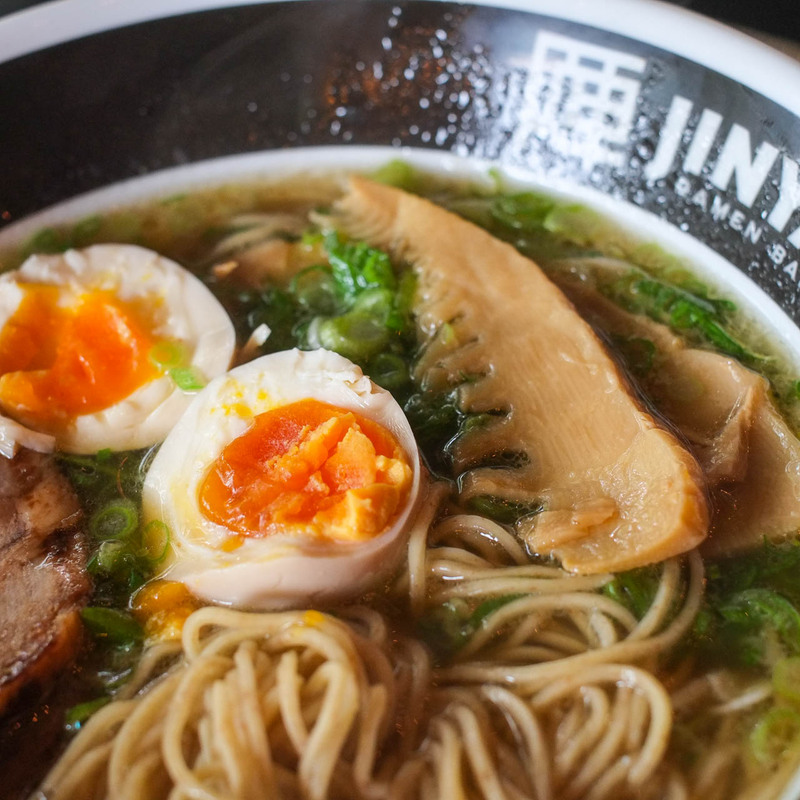 Old Skool Ramen ($13.80). 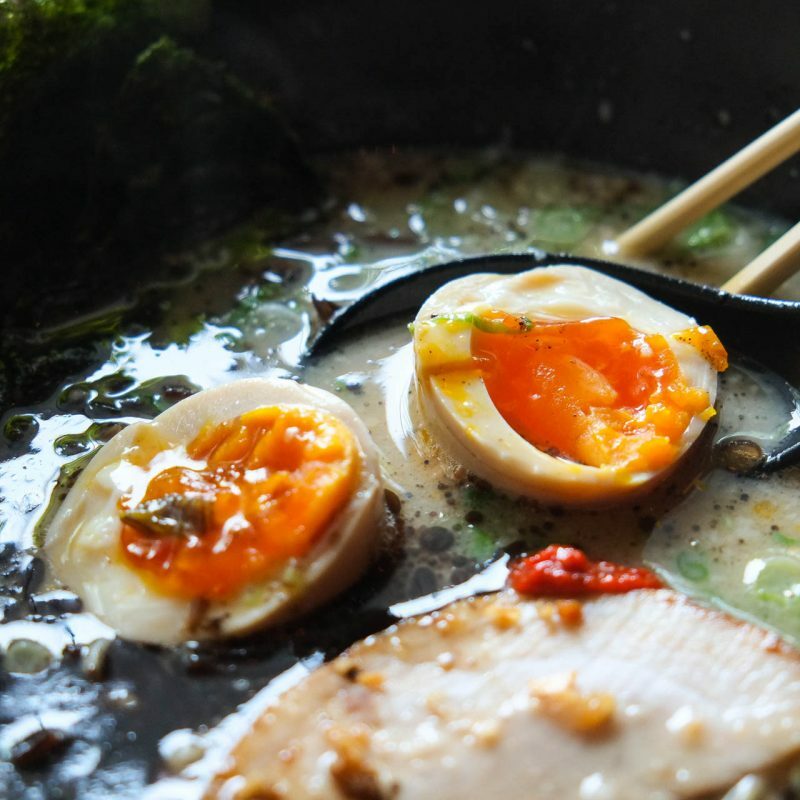 It’s a chicken broth-based ramen, with fish oil (! ), pork chashu, ajitama, bamboo shoots, and green onions. 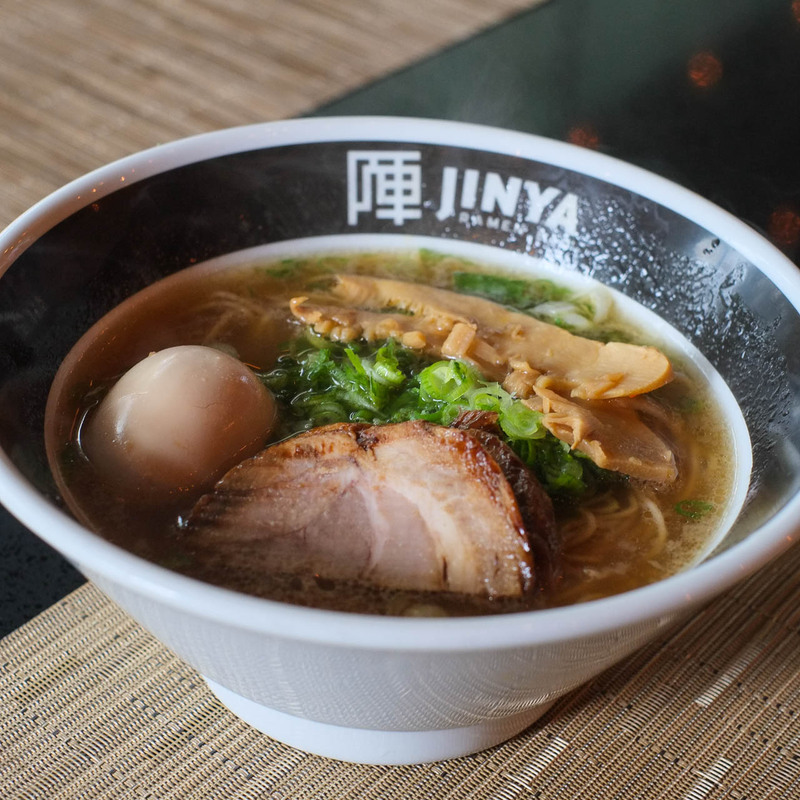 This one comes with the same thin whole wheat-based noodles that are in the JINYA Tonkotsu Black ramen. I like this bowl just as much as the Tonkotsu Black. But it’s almost the polar opposite. 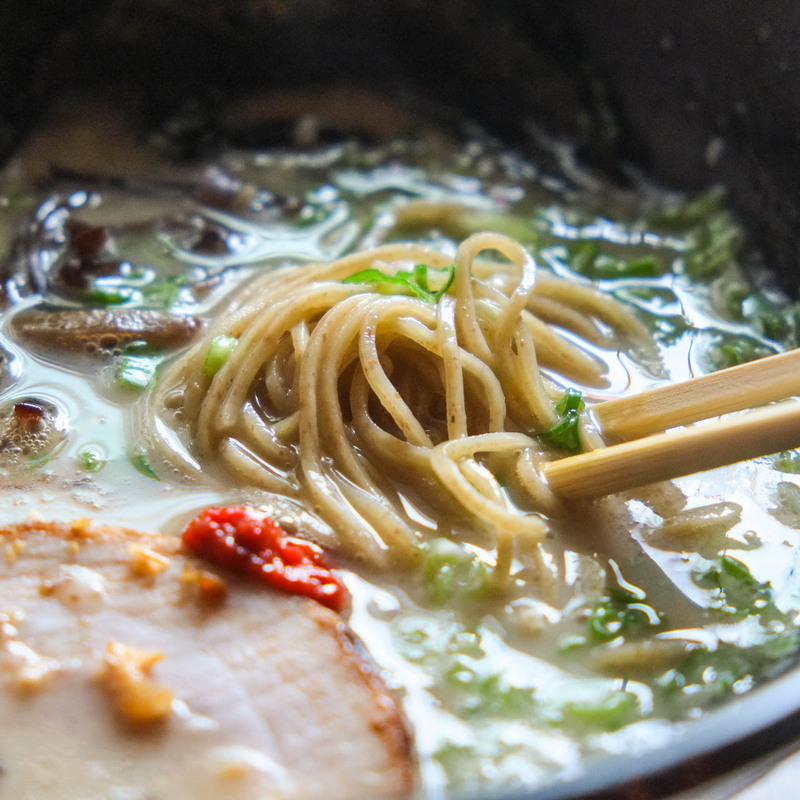 The broth is light, clear, and more straightforward. 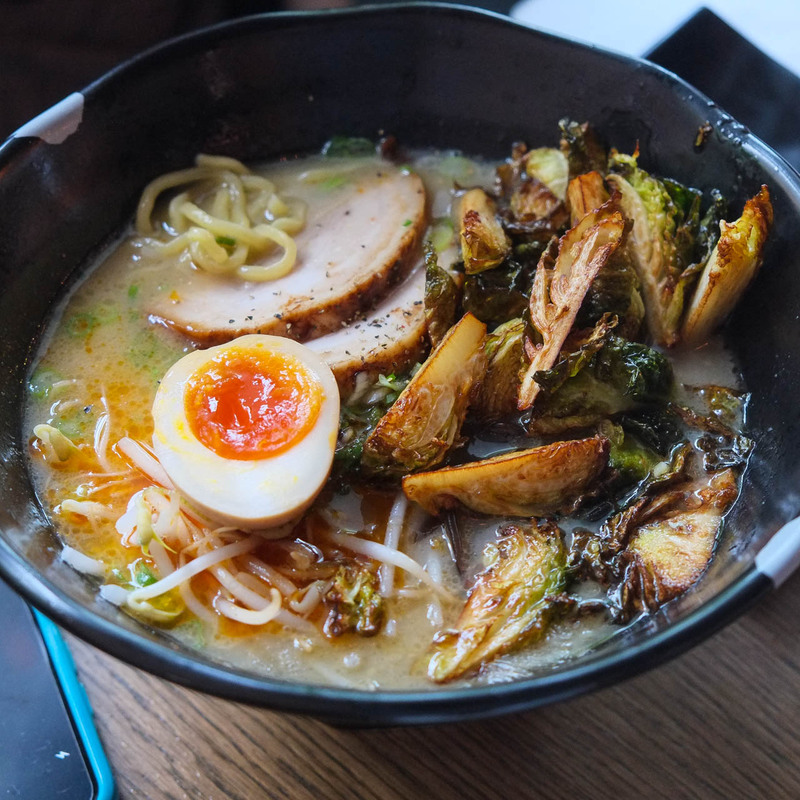 Tonkotsu does get a bit too rich for me sometimes, so it’s great having this “old skool”, lighter option. 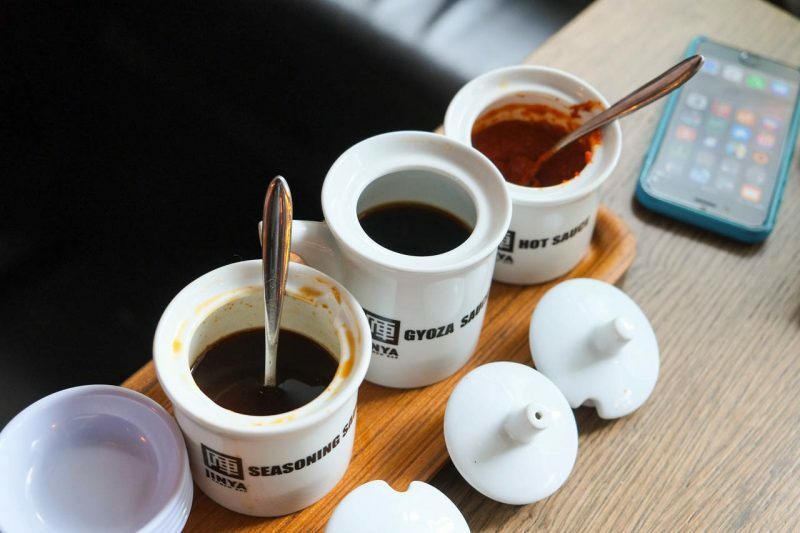 Lunch service was just as great as the dinner service. I was in and out in 20 minutes. If you went here during their opening week service and were really disappointed, you should try them again. 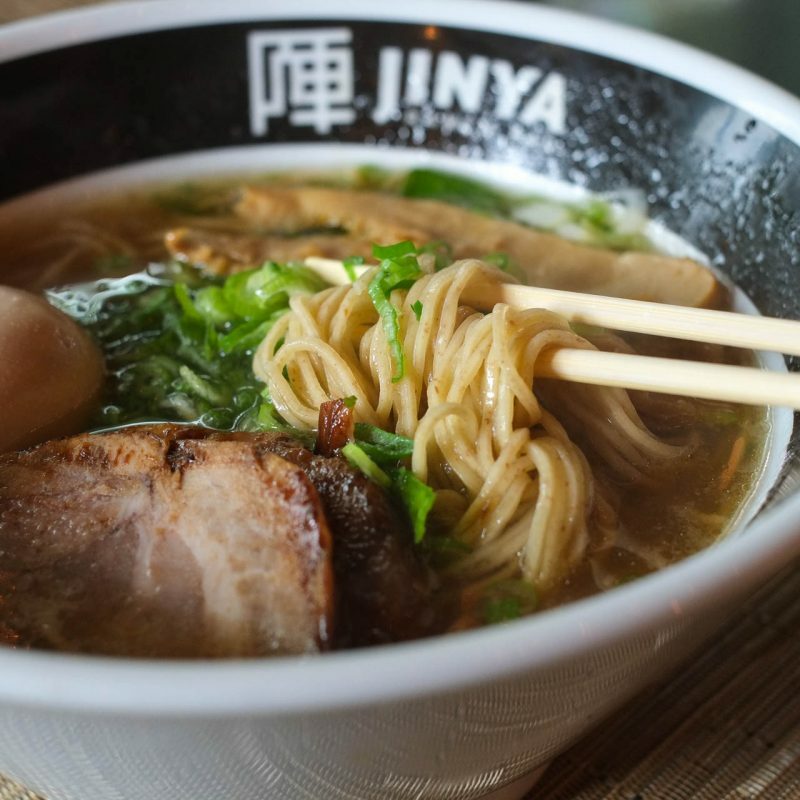 The ramen is a notch or two above “solid”, and the service is great. Try going during non-peak hours (which judging by the foot traffic here, may be non-existent). 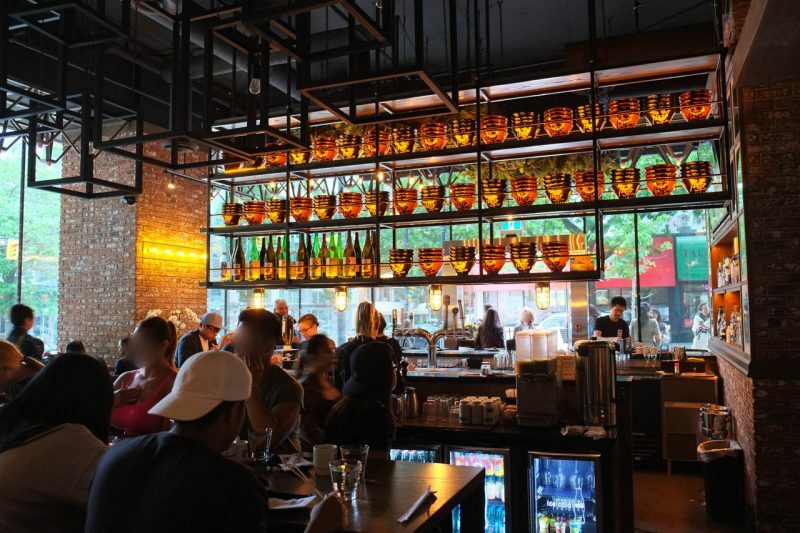 The prices are definitely upper-tier for ramen, but with the service and craft beer, it might tip the scales for you.